Sixteen people have been killed and 11 wounded when a passenger bus collided with a truck in the Omsk region in southeastern Siberia, local police say. Ten people have been taken to Omsk hospitals. The circumstances of the collision are being investigated. As evident from the first photos from the site, the truck was loaded with bricks.The bus was carrying employees from a local poultry farm. Ten ambulances and two emergency service teams have been sent to the area, TASS reports citing the local police press service. The crash has triggered a traffic jam stretching for several kilometers. "The way out of Omsk has been obstructed. Traffic police are regulating traffic to allow emergency teams to get through," a police representative is cited as saying. 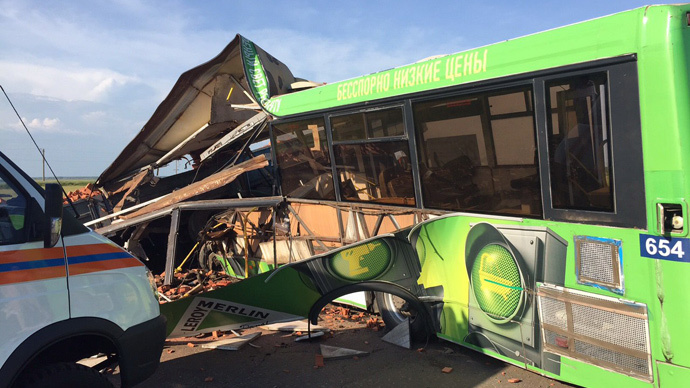 Preliminary investigations suggest the driver of the bus was to blame. Police say he may have driven into the oncoming traffic lane, TASS reports. This is the second deadly crash in the area in 24 hours. At about 3am local time, two cars collided head on, killing six people.